What a lovely lady! This filly is by WinStar’s young sireCONSTITUTION, the blue-blooded multiple Grade 1 winner by TAPIT. CONSTITUTIONpossesses all of the attributes to be the best son at stud by the world’s current leading sire: elite cruising speed, tremendous efficiency of stride, ability to carry his speed over a route of ground, eye-grabbing looks and conformation, a red-hot female family, and the class that comes with being a multiple Grade 1 winner. Not only was CONSTITUTIONthe first son of TAPIT to win Grade 1 events in back-to-back seasons, he remains the fastest racehorse around two turns ever sired by TAPIT. After becoming an undefeated Florida Derby-G1 winner as a 3-year-old in just his third start, CONSTITUTIONreturned at four to win the Donn Handicap-G1 - earning a giant 111 Beyer speed figure. He then set the breeding shed and sales ring on fire: CONSTITUTIONwas the #1 Freshman Covering Sire in 2016 with a $508,142 average from in-foal mares sold – higher than AMERICAN PHAROAH, and including a $2.2 million in-foal mare at Keeneland November. 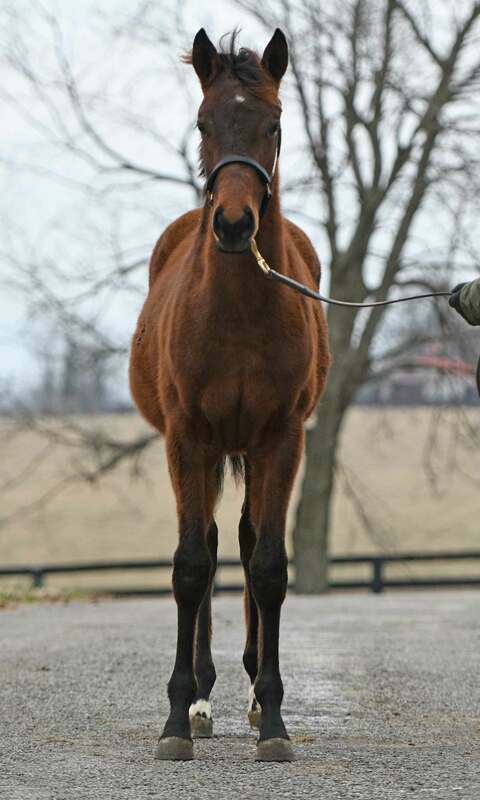 The following year, his first weanling fillies sold up to $185k and colts up to $170k, followed by his first-crop yearlings in 2018 who commanded $400k, $240k, $210k, $200k, $200k, $200k, $190k, $185k, $165k, $150k, etc. 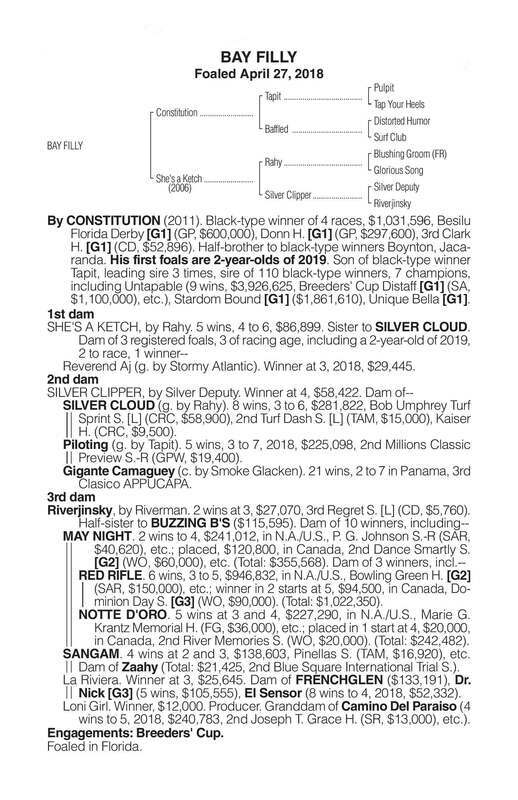 This FLORIDA-BREDfilly is out of the multiple race-winning RAHYmare SHE’S A KETCH, who is a full sister to stakes winner SILVER CLOUDand a half to two more stakes-placed horses. From just 3 foals, SHE’S A KETCH already has a winner to her credit and now has a CARPE DIEM two-year-old colt coming for her.